A folk song sung by Shahid Mallya, Khushboo Jain and music composed by Biswajit Bhattacharjee. Star Cast: Sanjay Singh, Asrani, Natalya Llina, Surendra Rajan, Kiran Sharad, Yajuvendra Pratap Singh, Amitabh Acharya. 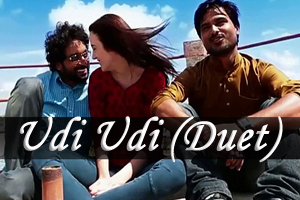 Lyrics of "Udi Udi (Duet)"
Lyrics in Hindi (Unicode) of "उडी उडी (डुएट)"